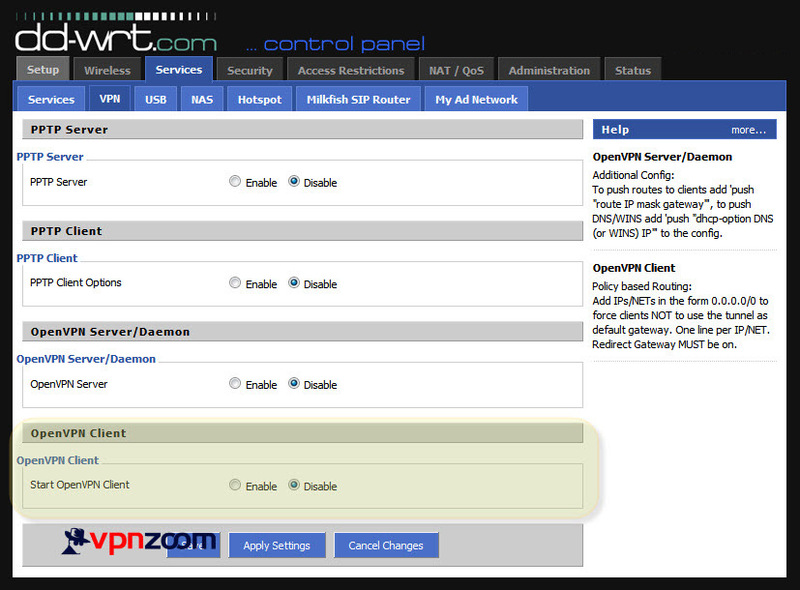 The following guide shows how to setup an OpenVPN connection on your DD-WRT firmware installed router. For more information about DD-WRT please visit the official website. Please note that this tutorial does not cover the installation of DD-WRT. If you have any questions about setup please contact our support team. Please visit the DD-WRT setup script directory to download the start up script template. 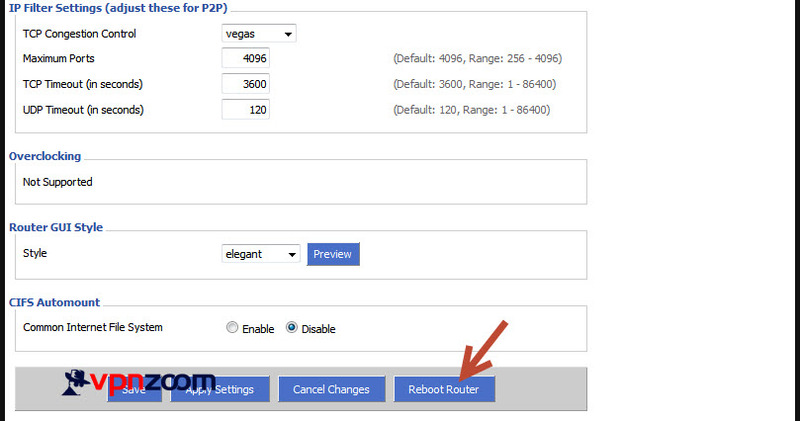 Step One: Log into your DD-WRT router by visiting the default gateway address in your browser. 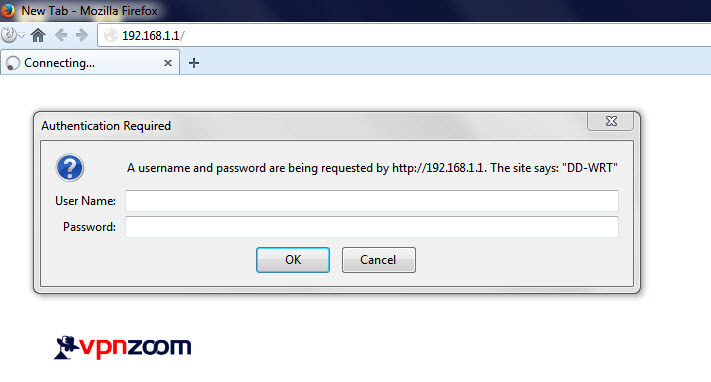 The default address is 192.168.1.1 -> Enter your username and password. Step Two: Once logged into the administration area click on the “Services” tab. Then click on “VPN”. Continue to the next step. Step Three: Locate the section titled “OpenVPN Client”. If you DD-WRT router doesn’t include this section you won’t be able to continue with this setup guide as your DD-WRT install doesn’t support OpenVPN access. It is possible that you are using a mini version of the firmware and need to upgrade to a mega version. If this section appears continue to the next step. Step Four: Click on the “Administration” tab and then click on “Commands”. 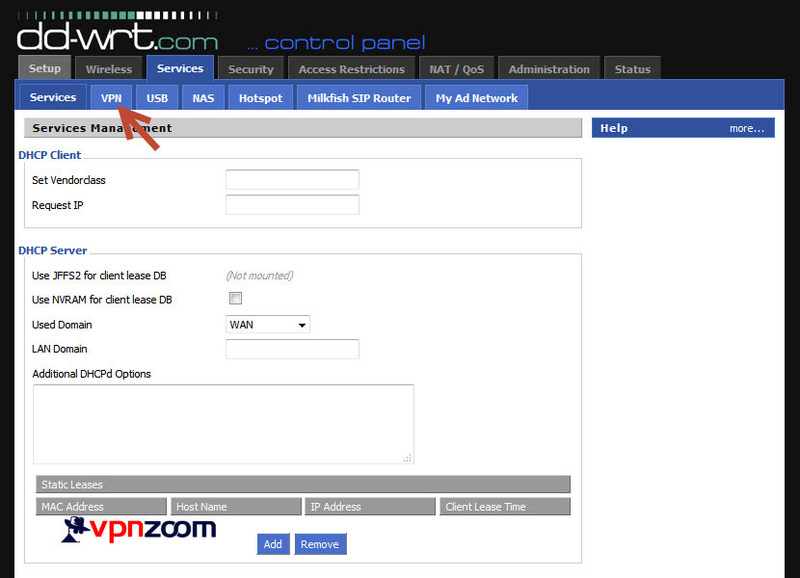 Now visit https://vpnzoom.com/dd-wrt-config/ to access a list of DD-WRT configurations based on server location. Find the location you want to use and open the text file. Copy all contents of the text file and paste into the “Commands” section in DD-WRT. Change your username and password in the start up script text. Now click on “Save Startup”. This process will create a startup script that runs every time your router is rebooted. Step Five: Now click on the “Management” tab and scroll to the bottom and click “Reboot Router”. After the router comes back online please allow up to 5 minutes for the VPN connection to be made. Your router should now be connected to our secure VPN servers and any device that accesses the Internet from that router will be protected and secured.